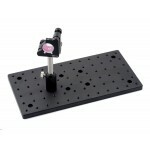 Opto4u offers a wide range of Black-Anodized, Solid Aluminum Optical Breadboards shipped from stock. Optical Breadboards provide the foundation upon which to mount optical components in the lab or OEM systems. Our Solid Aluminum Optical Breadboards are 1/2 inch thick and form the stable support structure upon which bases, posts, post holders, rails and numerous other optical components can be mounted. Our anodized Solid Aluminum Optical Breadboards have a matte black finish to minimize reflections from the optical work surface.